I remember playing Blast ‘Em Bunnies for the first time at an EB Expo before the PlayStation 4 had even launched. The team behind it, Nnooo, had it in a buggy and basic shape, but it worked, and it was in fact one of the games that really sold me on the console – there was Sony, sticking it up among its own AAA games as it showed off the potential for its console for both big blockbusters and home grown indie talent. That narrative resonated with me. Related reading: My preview of Blast 'Em Bunnies from back in 2013. That was years ago. Nnooo has had numerous distractions along the way (becoming a publisher, announcing a whole suite of games, and publishing Cubemen 2 on the Wii U among them), but now, finally, Blast ‘Em Bunnies us upon us and Nnooo has released its first HD title. 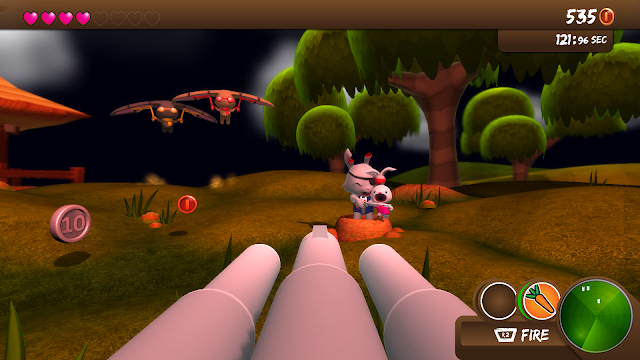 And all that work has been worth it, because while Blast ‘Em Bunnies is simple, gosh it’s a lot of fun. Blast 'em Bunnies gameplay: Easy mode! At core it’s a throwback to the old lightgun games at the arcade. You play as a stationary bunny, manning a gun turret that can swivel a full 360 degrees. All around you hostile rabbits spring up and make their way to your platform, at which point they’ll wallop you and you’ll lose a heart. Lose all the hearts and it’s game over. Thankfully, as you shoot the bunnies, they’ll drop coins (which can be used to upgrade your character between rounds), and the occasional powerup. Enemy bunnies come in a couple of different forms. Some move quickly but are easier to take out. Others fly in, while heavy bunnies that can take a lot of damage slowly march towards your position. Still others throw grenades. At first the waves come in simple patterns of just a few bunnies attacking in predictable patterns, but it quickly builds up until swarms are honing in on your position. Eventually the bunnies will take that last heart and defeat you, at which point you’ll spend your cash on new upgrades before starting a new game to try and do better than you did last time. It’s a score attack game, in other words, which brings me to my one significant complaint about Blast ‘Em Bunnies: for a game that is a score attack arcade game, the lack of online leaderboards is a bitter pill to swallow. The long term longevity of this game is sharply hurt when you can’t try and top the best times of your friends. Thanks to the PlayStation 4’s share button it’s possible to at least record your best performances, but online leaderboards would have helped this one a great deal, especially when the unlocks themselves can be earned after just a few hour’s play. 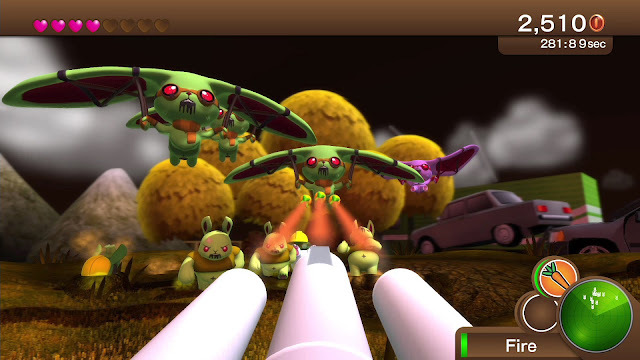 That aside, Blast ‘Em Bunnies is a really, really high quality arcade shooter. At a visual level it’s gorgeous, and Nnooo has really shown off the quality work the team has done from that side of things. Animals are smoothly animated and solid and rounded, in an cute kind of way. Backgrounds are simple, but colourful and well drawn. The weapons look great when they’re fired. It’s a bloodless shooter, so you’ll be gunning down your enemies with watermelon seeds, turnips, and exploding pumpkins. The bright, colourful environments actually reminded me a little of the kind of aesthetic we see in games like Plants Vs. Zombies: Garden Warfare, and that’s not a criticism by any means. Most importantly of all, though the loading times are excessive for a quick pick-up-and-play title, once you're in the game there’s not a moment of slowdown, no matter how packed the screen gets. The base purchase of the game includes a single arena to play on, but available through DLC are additional arenas, as well as alternative costumes for the bunnies themselves. I like that approach for the game. Players looking for a quick fix can buy the base game for a couple of dollars and get a full gameplay experience out of it. Players that get more stuck into it can buy the cosmetic changes that help keep the cartoon comic vibe going strong. My favourite mix is clown bunnies on the Japanese setting. That’s a good kind of lunacy right there. There are a few different difficulty levels to work through, with very hard throwing incredibly difficult swarms at you, and Nnooo has tried to add additional value to the game providing players with additional missions to complete along the way. 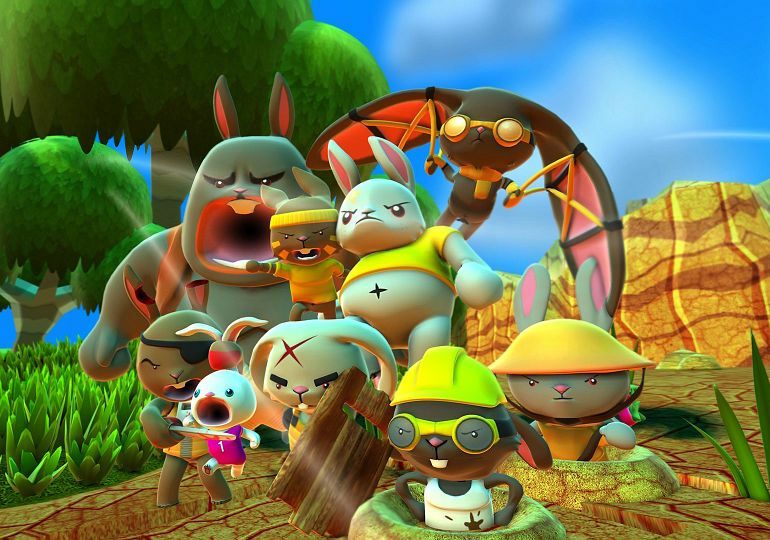 Unfortunately these missions are of the kind of thing that you’d be doing anyway – collecting coins and killing enemies – and it would have been nice to see Blast ‘Em Bunnies be a bit more ambitious with its gameplay mechanics. Perhaps setting players challenges such as optional targets to shoot in one direction why the actual threat – the bunnies – come from the other. It need not have been complex, but the missions really needed to take a leaf from the book of some of the mobile games out there, like Jetpack Joyride, in forcing players to take risks or go out of their way beyond the scope of normal gameplay to achieve them. There is a golden echidna-like thing that pops up every so often and shooting it will send you into a frenzy mode where you’re invulnerable and able to slaughter bunnies by the horde, but as optional variety beyond the core shooting that’s too infrequent. I want more. Speaking of wanting more, I know this is an arcade shooter, but some personality beyond the actual animations, as adorable as they are, would have been welcome. A cut scene or two, or some kind of story missions, even if it was brief, would have helped make me love the bunnies even more. Mind you, I am a narrative guy, and there really is a lot of personality in the way the enemy bunnies behave, so I’m perhaps being greedy there. For all its small issues, though, what I love most about Blast ‘Em Bunnies is just how refined and precise the whole experience is. Nnooo has always been a developer that has preferenced design integrity over ambition, and while this game doesn’t look ambitious (the fact that it’s a full HD game developed by a tiny team notwithstanding) it is flawlessly balanced to provide randomised hordes of enemies that give you a different challenge each time, but one that ramps upwards properly with each new wave. The enemies themselves are all well balanced too, to provide a distinctly different challenge each time without necessarily making any of them inherently more difficult to manage than the others. Related reading: An interview with Nnooo around Blast 'Em Bunnies. And it is all so bright and cheerful. I’ve long been a fan of how clean and slick Nnooo’s art direction is, and this game is no different. Blast ‘Em Bunnies might be simple – no, it is simple – but it’s simple in the right way, and that’s something to be impressed with all by itself. If you like my work, please back me on Patreon, so I can do a whole lot more in return!